Exterior painting project that our crew recently finished. In this picture you can see all of the prep work that is needed before we spray the exterior surfaces. This portion of the home would still need drop cloths put in place but is very close to being ready. All of the exterior including the roof was cleaned with our detergent application, caulked and then sealed in preparation for painting. This house is located in the Westchase Community of Tampa. All of the Bull-nose trim was painted and many areas were patched. The front of the house had many trim areas with cracks, that needed to be cleaned and sealed.After all of the windows have been taped with paper and plastic to protect from paint over spray. We spray the base color first, and then cut in the trim and other areas of the house. The front door has a lot of areas where paint can build up if applied too heavy. We taped and papered the area really well including all of the door hardware. Once all drop cloths were in place we sprayed a light coat in one direction. We allowed the paint to dry and then sprayed another light coat in a cross-hatching pattern. This allowed us to be sure we covered the entire door without applying too much paint and causing drip marks. The door was cleaned with bleach and TSP prior to taping and paper. We also ran a very fine grit sandpaper over the door, this helps hide any imperfections. Peerless painting contractors Tampa will help you choose the best accent colors. Accent colors on the steps and banisters are a nice compliment to the color scheme. The homeowner also asked us to paint the railings under the bar. Here you can see the rich birch color up against the soft green sage. This homeowner used the birch on the front door, garage door and in these areas on the pool deck. Accent colors like these cane really add a nice touch to your next house painting. This entire area was first sprayed with the ceiling color. 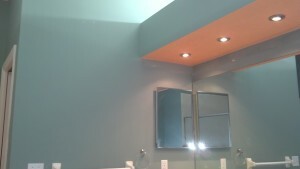 Ecru is a great ceiling color that compliments a variety of colors. This home received fifteen gallons of trim paint, thirty-two gallons of base paint and ten gallons of sealer sprayed and back-rolled. We applied Sherwin Williams Duration exterior house paint after a thorough cleaning and coating of Loxon Conditioner. All holes and cracks were filled with 60 year Sherwin Williams Powerhouse caulk prior to sealing. 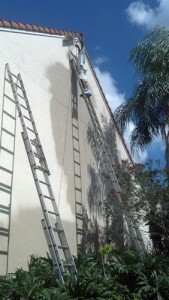 Peerless Painting Contractors Tampa will provide a detailed estimate with color samples. The paint is sprayed and back-rolled so you are receiving a very thick and evenly spread coating. We prefer to use Sherwin Williams coatings, but are familiar with spraying Ben Moore, Scott and Behr products. Duration exterior house paint by Sherwin Williams is very durable, and should only require a light washing with a garden hose every few months to keep clean. Bugs and insect nests should be removed as soon as possible to avoid staining. Annually, a soft wash detergent rinse with a low mixture of bleach and water should be applied to keep algae and molds at bay. This house paint comes with lifetime manufacturers warranty and is a one coat application.